When a BIM Section is generated, a block containing the drawing generation result is added to the model space of the target drawing, as well as a paper space viewport looking onto this block. The block and the viewport initially are placed so they do not overlap with existing geometry contained in the drawing. You can move this block or viewport to a new location, which will be preserved on subsequent updates. In the default template drawing which is used to create the generated drawings a Viewlabel and NumberBubble blocks exist. You can place them associated to the selected sheet view. 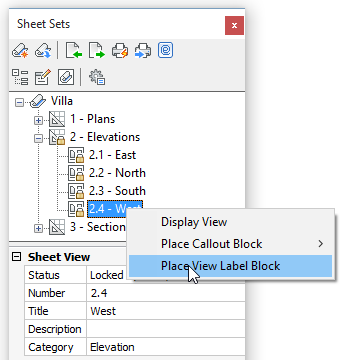 The Title block in this drawing contains attributes that will be filled in automatically when the associated Sheet Set properties are defined. A sheet list table can be placed on any sheet of the sheet set. In the current implementation, the table content is not associative yet. Open the Drawing Explorer - Blocks dialog. Double click the Title block. The Drawing Explorer dialog closes and the block is attached to the cursor. Click at the lower left corner of the paper sheet in the layout. Define the Project and custom properties in the Sheet Sets panel. Select the Title block, then click the Update Fields tool button ( ) in the Redraw/Regen toolbar. Select the sheet view In the Sheet Sets panel. Right-click the sheet view you want the view label block to insert for. Choose Place View Label Block in the context menu. Specify the scale factor or right-click to accept the current scale. Specify the rotation angle or right-click to accept the current angle. The View Label block is inserted. The Sheet Number (1), Sheet View Number (2), Sheet View Title (3) and Viewport Scale (4) of the selected sheet view are filled in automatically. Right-click the sheet view you want the number bubble block to insert for. 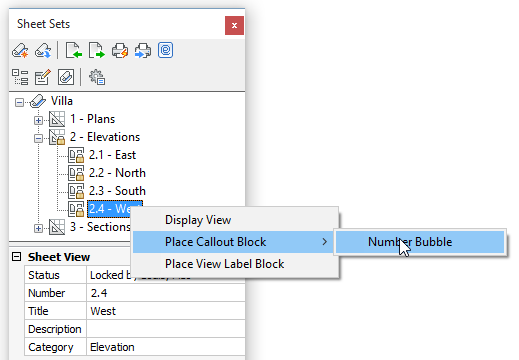 Choose Place Callout Block > Number Bubble in the context menu. The Number Bubble block is inserted. The Sheet Number (5) and Sheet View Number (6) of the selected sheet view are filled in automatically. A Sheet List table can be inserted on any sheet of the sheetset. In the current implementation, the table content is not yet associative and therefore will not be updated automatically when sheets are added, removed or renamed. Right-click the sheetset name in the Sheet Sets panel and choose Insert Sheet List Table in the context menu. You are prompted: Select insertion point. Specify a point in the drawing. Source files of the various callout blocks and the section tracker exist in the ..\Support\Bim\Sections subfolder of the Roamable Root folder. By default this is: C:\Users\<user_name>\AppData\Roaming\Bricsys\BricsCAD\Vxx\en_US\Support\Bim\Sections. 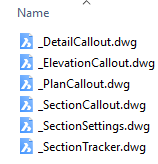 You can edit these files to customize the layout of the callouts and the section tracker blocks. 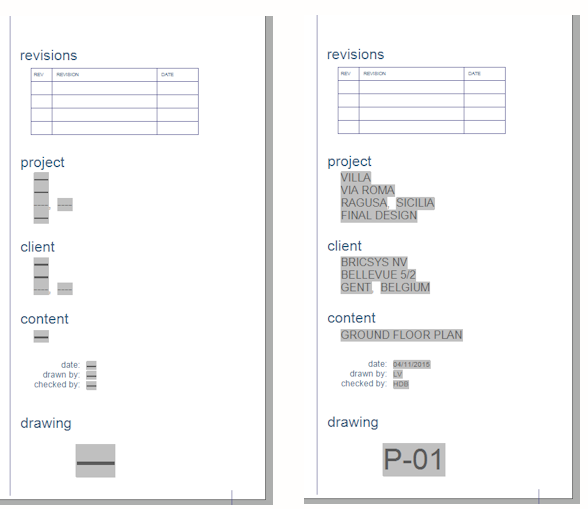 When a drawing is generated, the callout blocks needed are created from the callout blocks source file(s). When a BIM section is updated, the existing callout blocks in the target drawing are used.